5Paisa Auto Investor is an automated solution offered by the discount broker, 5Paisa, that provides recommendations to the clients of the broker in terms of the specific investments they should be doing. These investment inputs are provided based on several factors (more on that later). Let’s talk about this platform at length and understand whether you should be using it for your investments. Furthermore, we will also talk about how to make the best use of it before you put your funds into work. Let’s take a few examples in order to understand the generic problems faced by investors and how 5Paisa Auto Investor fits into the scene. Ishant, Rajan, and Varun subscribed to Alpha Beta Gamma Advisory services by paying for a hefty plan costing around ₹75,000 per month. All 3 users had subscribed to mid-cap equity services and were getting the same tips and recommendations (obviously!) from the advisory firm. In fact, all the clients of Alpha Beta Gamma Advisory services who had subscribed to the mid-cap equity services received the same set of tips and recommendations. Isn’t that weird? or strange? If everybody is following the herd or trend, then who is actually making decent money? Anjali and Ritika are neighbours who live in Prerna society in Mumbai. Anjali’s husband invests in mutual funds on a monthly basis and has been doing it for the last 1 year or so. Ritika and her husband are also planning to start monthly SIPs but are not sure what funds to start with. One fine day, Ritika asks for a few suggestions and Anjali comes back and recommends a couple of mutual funds to the former. Although, it may make sense to you that a friend is helping her friend but these financial decisions cannot be tailor-made and applied to everyone. Each one of us has different financial statuses, future needs and return expectations. Thus, taking a piece of generic advice from a “friend” might not be a perfect solution entirely. Its all about demand and supply at the end of the day and you need to realize one thing. Money is always in the gaps and is certainly not where the mass trend is. If it was that simple, then everybody should be making money and nobody losing out. This is where Personalized solutions such as 5Paisa Auto Investor come into the picture where you are provided with recommendations based on your own personal preferences, risk appetite and return expectations. ARQ from Angel Broking is another such example that provides automated recommendations as per user profiles to go along with Sharekhan Neo. Such solutions give you a differentiated value and provide you with a way that is as per YOUR requirements and is not a mass market trend that everybody is going to follow. And the best part is, its different for everyone. Thus, the example we quoted at the start of this article including Ishant, Varun and Rajan, well – all three users, in this case, will get different tips and recommendations since they have different needs and requirements. What is 5Paisa Auto Investor? 5Paisa Auto Investor is a web-based automated advisor that recommends a portfolio of mutual funds based on your requirements. The way it works is simple too. Through the use of its “Smart Profiler”, it takes in and understands your demographic details and sets yours apart with deep insights into your profile. Then through its concept of an Intelligent Advisor, it analyses your responses across the screens (discussed later) and sees what exactly your objectives are before providing you personalized recommendations of mutual funds. Furthermore, the 5Paisa Auto Investor consistently monitors your investments so that your set objectives stay aligned all the time. 5Paisa Auto Investor – How does it Work? There is a specific procedure that this algorithm based web solution – 5Paisa Auto Investor passes the user through before recommending with investment options and corresponding monetary segregations. First up, you need to provide your basic details so that username and password can be sent to you in order to continue with the rest of the process. Invest liquid cash (suitable for you in case you are looking to make short-term quick profits out of the extra cash lying in your bank account). Let’s say you selected “Invest for a Goal” option. In that case, the system notifies you that the kind of recommendations you will get will be customized as per your goals. One thing that experts talk about all the time is – Never Keep All the Eggs in the Same Basket. This also implies that you must always diversify your investments. This concept is highly applicable here the most since you are looking for a long-term investment and not short-term quick gains. Thus, it becomes all the more important that you diversify and minimize your risk. Thirdly, you will also be notified that the return percentage that will be displayed along with the investment options will be based on the historical returns. You must enter your specific details here so that the recommendations for mutual fund investments you get at the end are as per your earnings and savings bracket. A little inconsistently here may jeopardize the whole investment plan. Thus, be sure of the validity of the numbers you put here. Thus, based on your plans and return expectations, you may choose any of the following mentioned options and thus, continue ahead in this recommendations portal. In that case, you can assume a time horizon of around 20 years and maybe around 30 lakhs of capital by the time your child is ready for higher education. Placing these numbers in this step gives the system an idea of your return expectations and overall time period of investment. With these important pieces of information, the algorithm can suggest you suitable mutual funds along with their return percentage details. The final recommendations will include the funds and classes based on what choice you make here in terms of your return on investment expectations. In the next step, you need to mention your risk appetite. In other words, you need to express how you will react when the market shows a downward movement. The kind of reaction you show here will have a direct impact on your recommendations. Once you do that, you get to Name your Goal so that you can track it in the future. 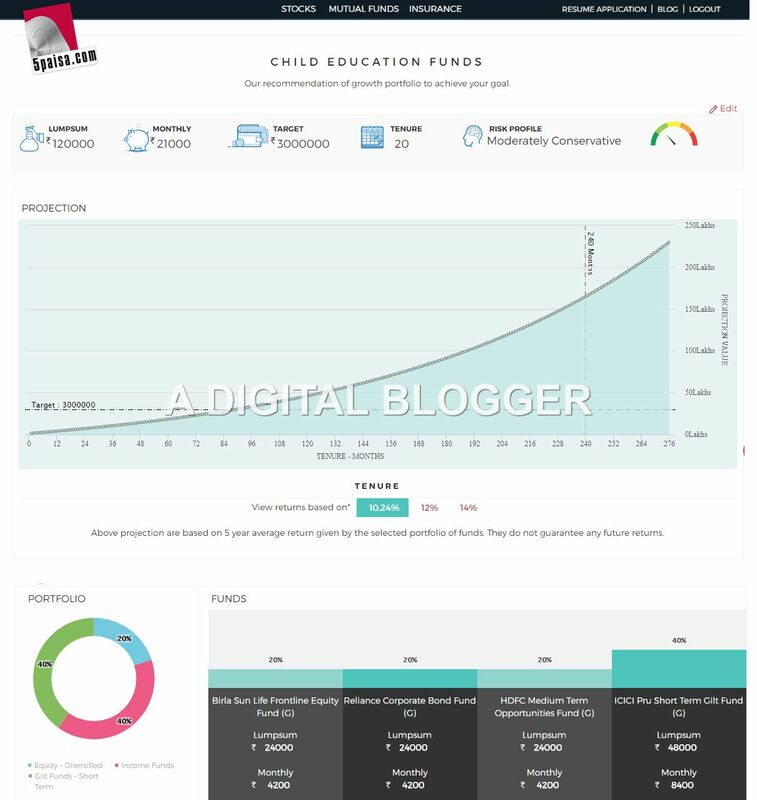 Let’s say for this example, name this goal as – Child’s Education Funds. Now, click on ‘Get Portfolio’ to view the recommendations from this 5Paisa Auto Investor Tool. In case you did not register yourself as mentioned at the very start of this article, you need to do that by scrolling up and providing your basic details so that you can be sent the username and password. Otherwise, you will not be able to view any investment recommendations. Based on what values we have put in this example, the following recommendations are provided to you. You may choose to invest these funds in these funds. So this is how the overall procedure under 5Paisa Auto Investor works. The best part is that you can continue investing in different fund options based on different goals you have. You can invest in specific funds that can provide quick returns for your holidays 2 years later and then you can invest in other funds that can secure your daughter’s wedding 20-25 years down the line. What happens if Stock Broker Goes Bust in India?